Sometimes you’ll want to fill and area with color, but you don’t want the texture of a stitched area – or you don’t want to take the time). One possibility in those situations is to fill the area with colored pencils or crayons. In this video I show you how to stabilize the fabric for coloring, and how to heat set it after you’re done. Here’s the finished piece I started in the video. I REALLY. love to do an all-dark outline when I color the fill. To me it has a playful, cartoony look that suits my drawing style. This free pattern uses the same coloring technique, but I match the outline thread to the fill color. It’s a different look and one you’ll also want to have in your tool basket. I think it works best for more realistic images. By the way – that dark outline looks like black, but it’s really DMC #3371. That’s a very dark brown and I use it a lot of places you’d expect to see black. I think black outlines and eyes can sometimes look a little harsh. Using this color takes the edge off. Is the fabric washable after? Yes – these should be washable if you heat set the drawings afer you color them. BUT I would definitely test it first because different brands of colored pencils and crayons will behave differently. I used Crayola crayons and Prismacolor colored pencils. I heat set them with a HOT dry iron, and I wash them with cold water and gentle soap. Test YOUR brand of coloring tools, YOUR temperature and duration of heat setting, and the temperature and detergent YOU usually wash with. That’s really the only way to be sure. 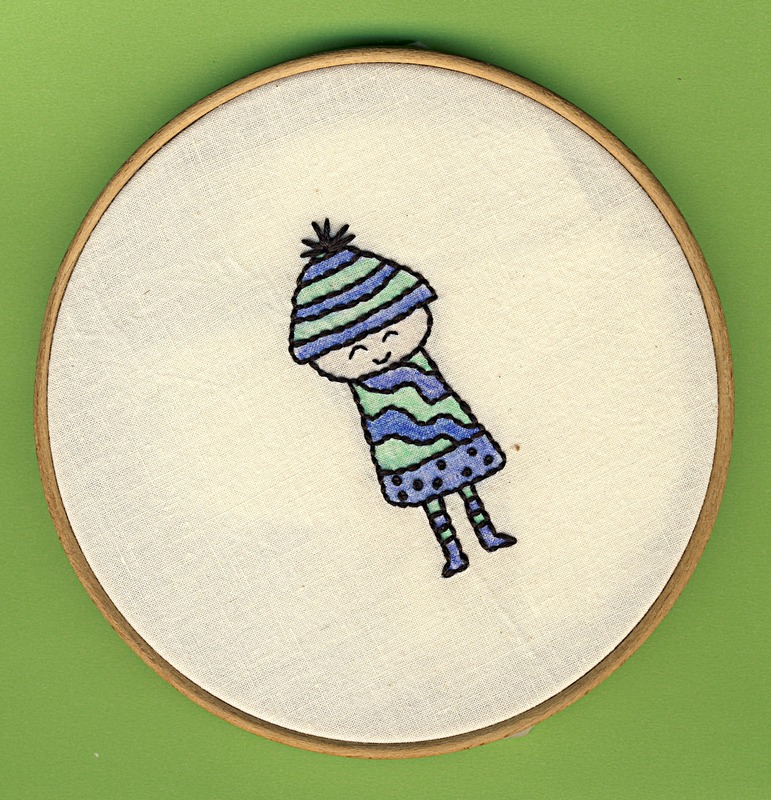 Can you do the color fill on already-embroidered projects? Never thought of freezer paper. Super idea. Thank you. I love using crayolas with my embroidery.